This stylish bookmark made with a real Eucalyptus Red Gum leaf makes a beautiful gift for him or for her. The leaf is hardened with copper and finished in a high quality 22 carat hard gold coating. It comes beautifully gift-packaged and includes a story card. Draped on a Holy Book, a wedding register, guest lists or a favourite inspirational book, it makes a stunning adornment from Mother Nature. No two leaves grown by Mother Nature are ever the same, so the leaf you get will be your own unique piece of Australia! It will be similar to the bookmark photographed on the website, but it will have its own natural variations in shape and size. 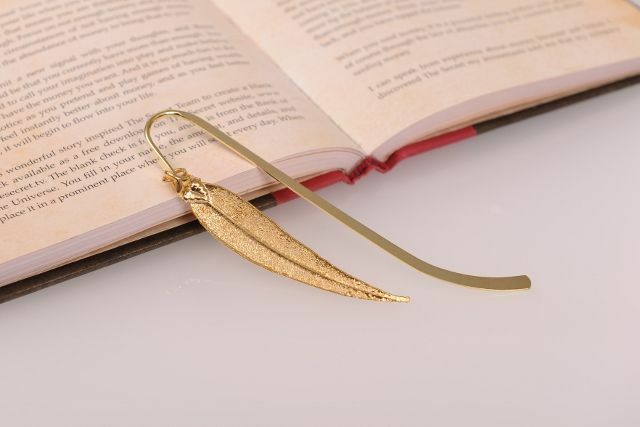 Each leaf in bookmark collection is unique as each one is hand-picked from a native tree or a bush and becomes a stunning bookmark after a careful and lengthy process which creates a hard metal shell around the leaf, encasing it forever.